When you visit our airport shuttle and transportation Web site you may provide us with two types of information: personal information you knowingly choose to disclose that is collected on an individual basis and Web site use information collected on an aggregate basis as you and others browse our Web site. Broadly speaking, we use personal information for purposes of administering our business activities, providing customer service and making available other products and services to our customers and prospective customers. Occasionally, we may also use the information we collect to notify you about new Vail Transportation and Denver Limo services and special offers we think you will find valuable. The lists used to send you product and service offers are developed and managed and designed to safeguard the security and privacy of our customers’ personal information. As a customer, you will be given the opportunity. If you wish to opt out of receiving offers directly from Eagle Vail Express you can unsubscribe by following the opt-out instructions in the emails that they send you located at the footer of the communication. We can be reached by postal mail at 76 West Meadow Drive, Vail, CO 81657,or by phone at (877-824-5397). 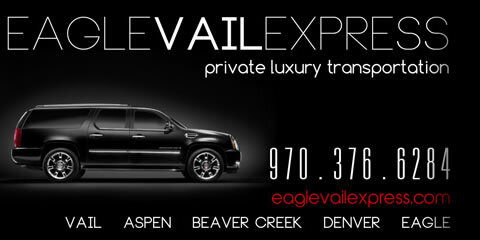 You can email us at Matt@EagleVailExpress.com with questions, comments or suggestions.